The Sepulveda apartment is perfect accommodation for 6 people. Apartment has 2 bedrooms with 2 single beds and wardrobe, 1 double bed and 1 sofabed in the livingroom. The apartment has a fully equipped kitchen with all tableware, microwave, stove, toaster etc. There is one bathroom with a shower in the apartment. The accommodation is equipped with air-conditioning and WiFi internet connection. For your convenience there are laundry appliances. 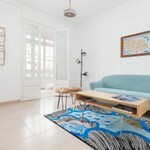 Beautiful Sepulveda apartment is located in Eixample, one of most interesting central areas in Barcelona. Beautiful, old, winding streets lead to hidden plazas. Cramped apartment buildings often have historic, little shops and bars. The neighborhood is known for the load of tourist traffic that brings extensive attention. Late night revels the glamour of clubs and number of restaurants.